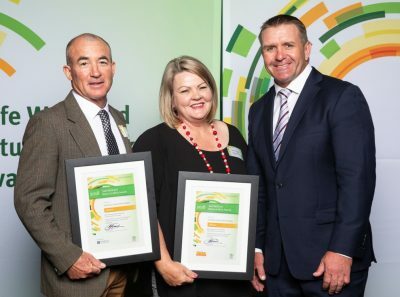 A CENTRAL Queensland beef producing family recently earned an important state government- backed workplace safety award for their project designed to reduce risk associated with moving stock across a busy regional highway that dissects their property. Bradley and Kerryn Piggott operate Christmas Creek Cattle Co, a 20,000ha beef breeding and finishing operation near Rolleston, 200km south-east of Emerald in the Central Highlands region. The Piggotts identified safety risks to their workers, dogs, horses and livestock while shifting cattle from one part of their property, to the other side of the busy Carnarvon Highway. The issue only worsened when the road was upgraded from gravel to sealed, and the speed limit increased to 110km/hr. The upgraded highway also carried more traffic. State of Origin legend Shane Webke presents Bradley and Kerryn Piggott with their workplace safety award for best solution to an identified work health and safety issue. In a field covering all forms of business and industry across Queensland, the Piggotts recently received the 2018 Safe Work awards category win for ‘best solution to an identified work health and safety issue.’ The annual awards are convened by WorkCover Queensland. “Crossing the highway was a huge safety risk to our business, through unpredictable livestock and employees and family members on horses or quads,” Kerryn Piggott said. 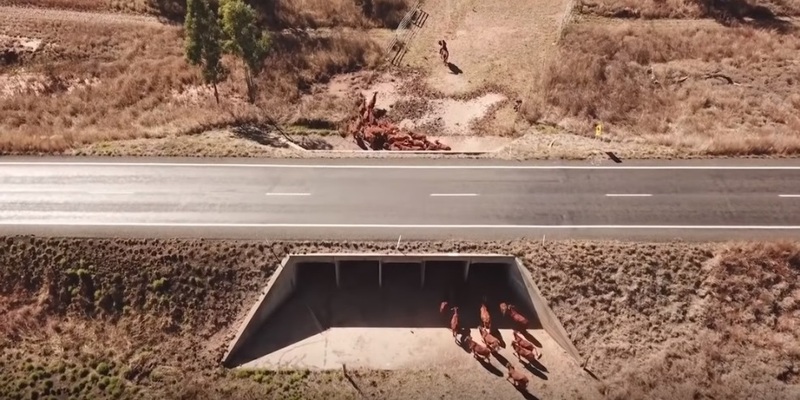 The solution was found in an existing large flood drainage culvert running under the highway, which the Piggotts identified as being suitable to move cattle through to avoid hazardous road crossings. “It was important to Bradley and I that our team was engaged in the decision-making. We identified the problem, and carried out the work as a team. Now, shifting cattle from one side of the road to the other is a whole lot safer and simpler. One person can do the job that required three or four people before,” Mrs Piggott said. Improved morale, productivity and the safety culture amongst workers because they were involved in the decision-making process throughout. Mrs Piggott said it was after an earlier workplace incident on Christmas Creek that they started searching for a specific WHS program that was going to be easy to manage and implement, met the business’s obligations under the WHS Act, and would provide good policy and procedure to help protect the business. “The options out in the marketplace are endless, and can be expensive and time consuming,” she said. Safe Station is a comprehensive Safety Management System that is tailored to suit specific livestock and cropping operations. The program (https://www.safestation.com.au/) is delivered and supported by the Central Highlands Regional Resources Use Planning Co-Op (CHRRUP) in Emerald. CHRRUP is an independent community-owned organisation dedicated to increasing the sustainability of natural resources through improving practices of use and management. “To our business, Safe Station is a living document that is reviewed regularly and updated accordingly by our business,” Mrs Piggott said. “To be recognised for making one aspect of what is dangerous industry to work in safe, makes us very proud of our team and their hard work and dedication to safe work. This award belong to them, more so than us,” she said.